Tom was born in Outlook, Saskatchewan, and moved to Manitoba at a young age. He sang for several years with the All Saints Anglican Men and Boys Choir of Winnipeg. He finished his postsecondary education at the University of Manitoba in Fine Arts. Tom has sung with several choirs in both Winnipeg and Vancouver, including the Manitoba Youth Choir, Chor Leoni Men’s Choir, the Phoenix Chamber Choir, and the Vancouver Cantata Singers. He was chosen for three years to be a member of the National Youth Choir of Canada. Tom was also in the Holy Rosary Cathedral’s vocal quartet in Vancouver for five years and is currently a section lead at West Vancouver United Church. 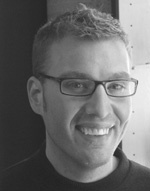 Tom joined the Vancouver Chamber Choir in 2000. He is thrilled to be able to sing with such a distinguished ensemble and to meet some amazing people. One of his favourite tour memories occurred in Taipei in 2001, when he and other VCC singers were bombarded for autographs by audience members at the stage door following the concert.